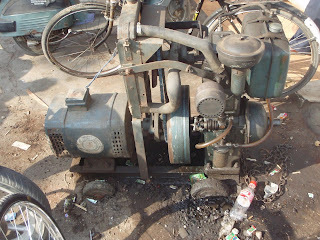 Hanuman Chowk is of the main intersections in town, near the market area. It's meant to be around-about, but you can pretty much drive whichever way you want around it. You just have to have the loudest horn, or biggest vehicle. The scene gives you an idea of the importance of religion around here. The figure is Hanuman, an ape-like humanoid, one of the main characters in epic Indian poetry. You can basically read any paragraph on this wikipedia page to understand how awesome these stories are! Hanuman appeared as a small talking monkey before Arjuna at Rameshwaram, where Sri Rama had built the great bridge to cross over to Lanka to rescue Sita. Upon Arjuna's wondering out aloud at Sri Rama's taking the help of monkeys rather than building a bridge of arrows, Hanuman (in the form of the little monkey) challenged him to build one capable of bearing him alone, and Arjuna, unaware of the monkey's true identity accepted. Hanuman then proceeded to repeatedly destroy the bridges made by Arjuna who became depressed and suicidal, and decided to take his own life. Something tells me that this generator has been here for a few weeks -- maybe it's that the wheels are almost fully submersed in the sludgy ground? And that it's chained up? A monkey movie that I shot during the Mussoorie weekend, posted by request! This is a very typical (modest) float for the front of the parade that took place last weekend. 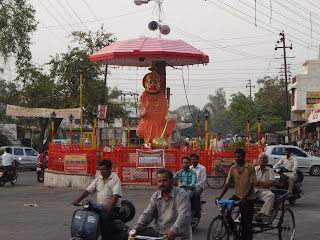 It was Rama's birthday, so there were floats for lots of the various gods that Hindus celebrate. In this particular parade, Rama's float was the biggest & most important, and at the end. 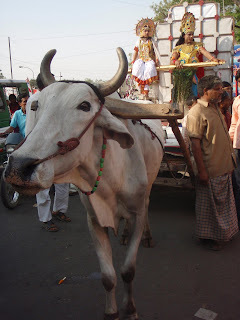 walked up the street against the flow of the parade, working my way towards Rama's float. I really dig the tunes! The mix of traditional sounds + electronic enhancement seems to make all the folks around to dance.